Kruptos 2 Professional uses the AES algorithm (256bit) to secure your data. The Advanced Encryption Standard (AES) is a specification for the encryption of electronic data established by the U.S. National Institute of Standards and Technology (NIST) in 2001. It is based on the Rijndael cipher developed by two Belgian cryptographers, Joan Daemen and Vincent Rijmen, who submitted a proposal to NIST during the AES selection process. Rijndael is a family of ciphers with different key and block sizes. For AES, NIST selected three members of the Rijndael family, each with a block size of 128 bits, but three different key lengths: 128, 192 and 256 bits. AES has been adopted by the U.S. government and is now used worldwide. It supersedes the Data Encryption Standard (DES), which was published in 1977. The algorithm described by AES is a symmetric-key algorithm, meaning the same key is used for both encrypting and decrypting the data. 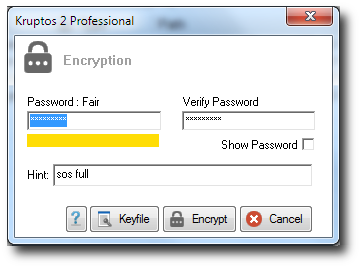 Once a file has been encrypted using Kruptos 2 Professional it cannot be opened, changed or viewed without the correct password. If you forget your password then your files will be lost. Kruptos 2 Professional does not have any backdoors or secret keys so we will not be able to help you retrieve your lost password.